TJ Formal Dress Blog: Wedding dresses - to bead, or not to bead? "When a woman envisions her walk down the aisle, one of the biggest mysteries is what she will wear on her special day. Searching for wedding dresses can be a wonderful experience, but it also means sifting through endless options to choose a single frock for the affair. Of course, aside from style and silhouette, a girl must figure out how much beading she desires. It may not be obvious, but the intricate detail can take a gown from simple to complex in an instant. Girls who are certain they want to be covered in beading should take the time to search high and low for different styles. While certain adornments (such as sequins) look magnificent, their affect on a piece can be dramatic. As always, the key to finding the gown of one's dreams is by beginning the search early. As soon as a ring is slipped on a girl's finger, she can do herself a favor by starting her quest for 'the' dress." 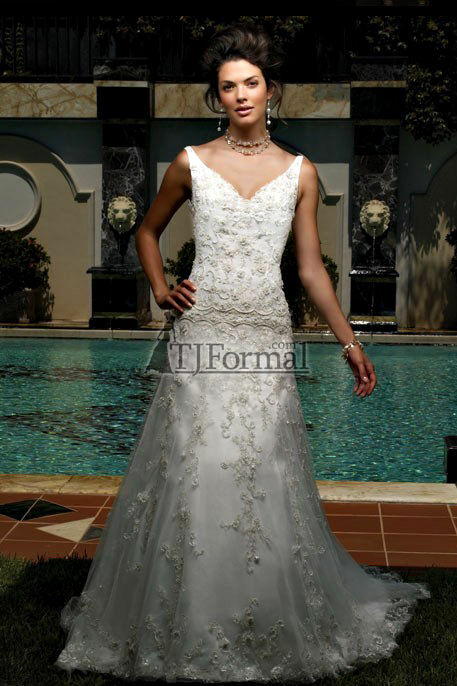 At TJFormal we have wedding dress styles that are simple, yet elegant, with minimal beading, and extravagant and stunning with beading galore. Mori Lee Voyage Wedding Dress 6141 has scattered beads on the bodice that accent the elegant simplicity of this gown. Casablanca Wedding Dress 1860 has dramatic beading and lace over the entire gown. This Casablanca dress is just GORGEOUS! The beading and lace are not over the top, but add just the right sparkle. I love the neckline and think this is very flattering.